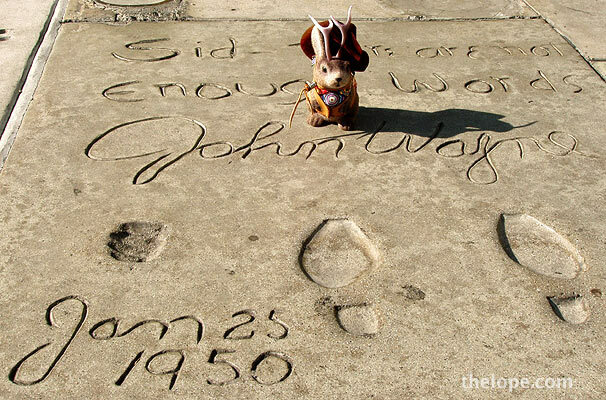 In August of 2005 Ace Jackalope and his entourage took a trip to LA along Route 66. Once there, we headquartered in Hollywood for a few days. I'm not much of a movie person, but with the Oscars coming up tomorrow I thought I'd post some pictures of the area in which all those shiny statues are handed out. 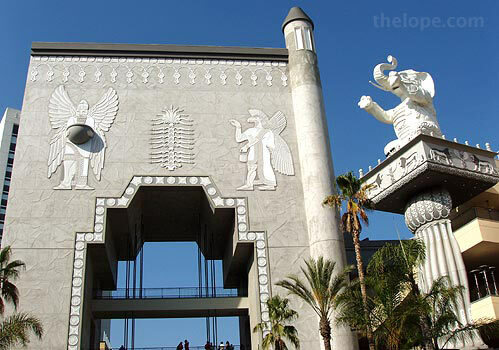 The Kodak Theatre is that white Egyptian-inspired complex tucked away in the Highland Center, a conglomeration of shops, restaurants, nightclubs, theaters and the Hollywood Renaissance Hotel at Hollywood Boulevard and Highland Avenue. 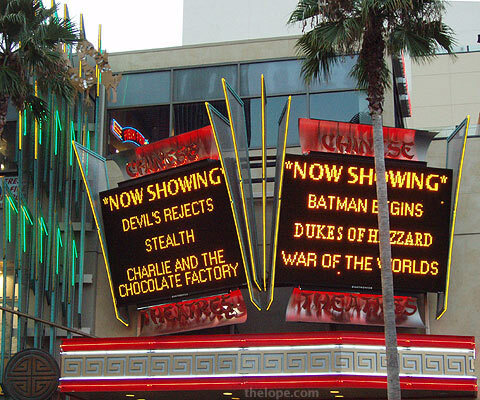 The Kodak Theatre is neither old, nor historic; it was finished in 2001 and was built specifically to host the Academy of Motion Picture Arts and Sciences, according to Wikipedia, which also mentions that Kodak paid $75,000,000 to have the theater named for them. 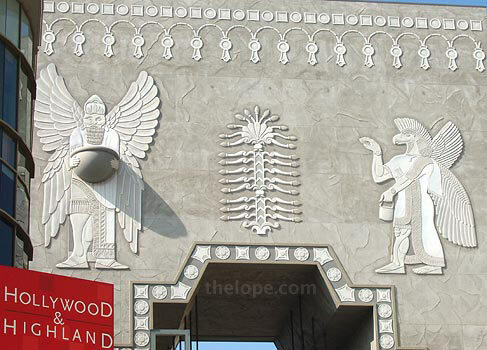 I suppose the style of the exterior of the theatre is a current incarnation of Egyptian Revival, a style of architecture which pops up regularly whenever a culture becomes infatuated with ancient Egypt, or sometimes when a colossal statement of ego is required. That's Hollywood. 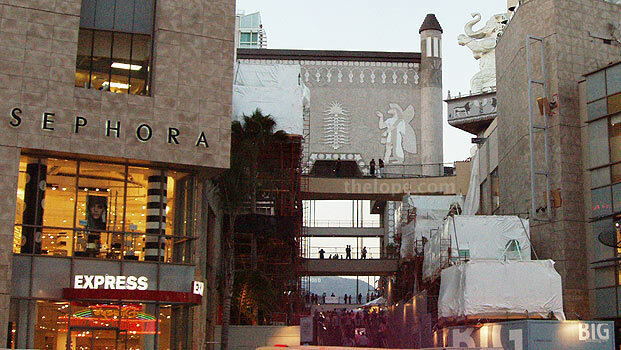 The Kodak Theater is adjacent to the Grauman's Chinese Theatre, which opened in 1927 with much fanfare. 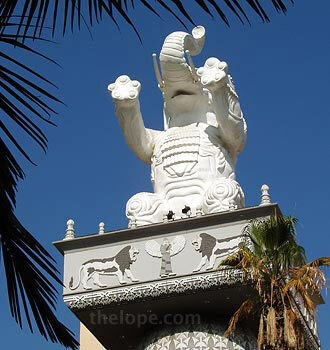 The exterior of the theatre was made to resemble a giant Chinese pagoda and, according to the theatre's website, many of the decorative elements of the theatre were imported from China. Sid Grauman was the personality most associated with the theatre, but he wasn't the sole owner. 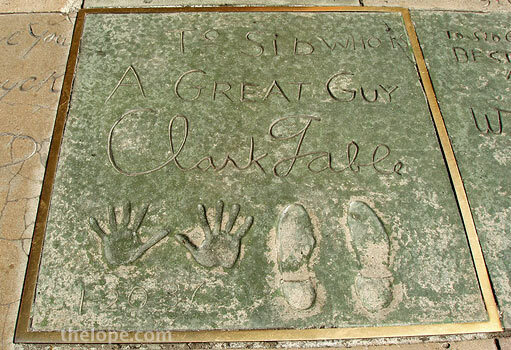 Silent film personalities Howard Schenck, Mary Pickford and Douglas Fairbanks were his partners, and in fact Grauman actually sold his interest in 1929. He continued on as Managing Director until his death in 1950. 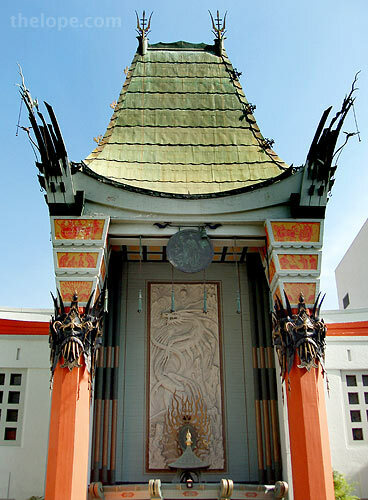 According to Wikipedia, Mann Theatres bought the place in 1973, and it was renamed Mann's Chinese Theatre. Mann Theatres bankrupted in 2000 and the building is now owned by a partnership comprising Warner Brothers and Paramount Pictures. 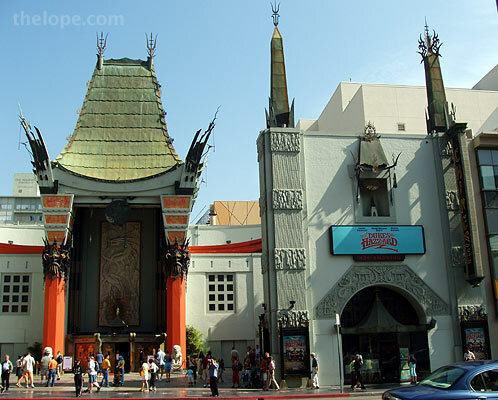 In 2002 the original name was restored to the business, so it's Grauman's Chinese Theatre again. Though grandiose, Grauman's is not immune to the business trends that influenced small-town theatres. In recent years, a modern six-plex theatre was added. 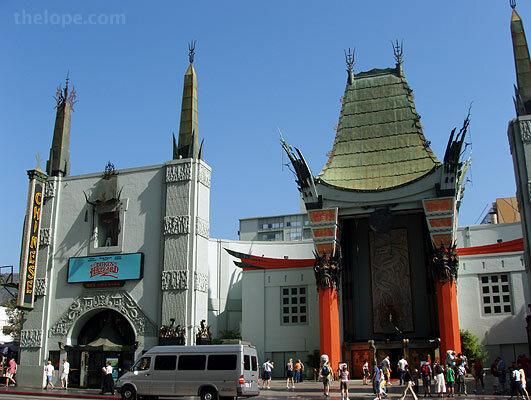 But it's really the forecourt of Grauman's that attracts tourists. 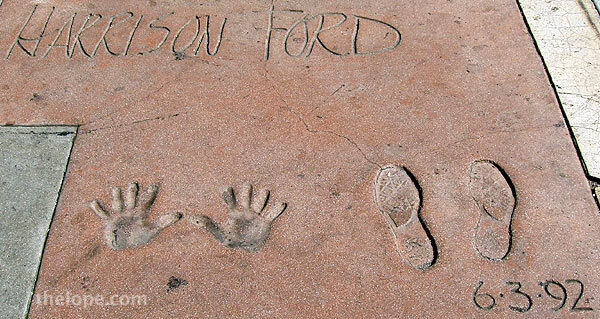 The theatre's website has a map of the various stars' footprints, hand prints, other sorts of prints in cement. 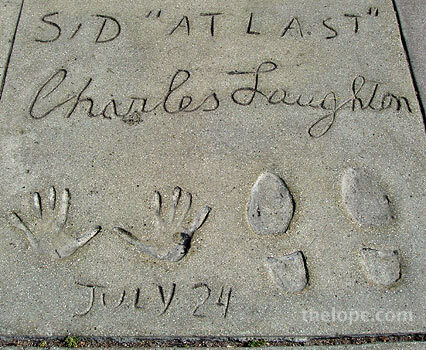 John Wayne wrote, "Sid, there are not enough words", and left an impression of his fist as well as his hands and feet on January 25 of 1950. Michael Douglass left his impression in 1997 above that of his father, Kirk Douglass, who left his in 1962. Patrolling the area are various faux stars, who pose for the tourists' cameras. Tips are appreciated. Catnip ain't free, ya know. Speaking of Catwoman, Batman was here, or at least Michael Keaton was. Marvel comic characters were also represented. 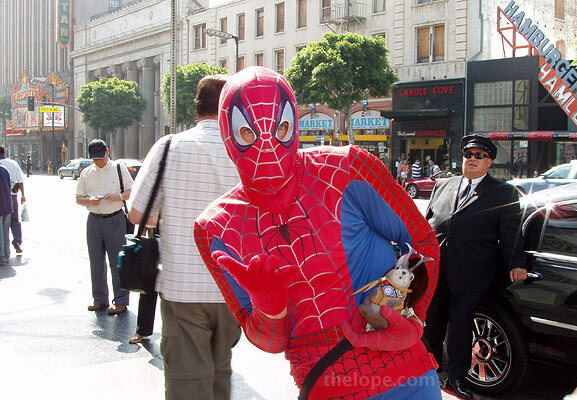 I don't know why the chauffeur behind Spiderman was leaning away. We also know where Harrison Ford likes to have a cup of coffee now and again. He left his impressions in 1992. 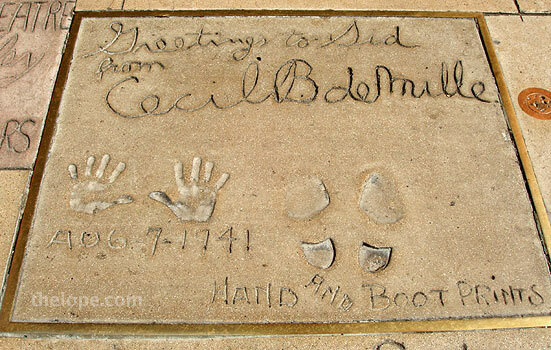 Cecil B deMille left his hand and boot prints on August 7 of 1941. 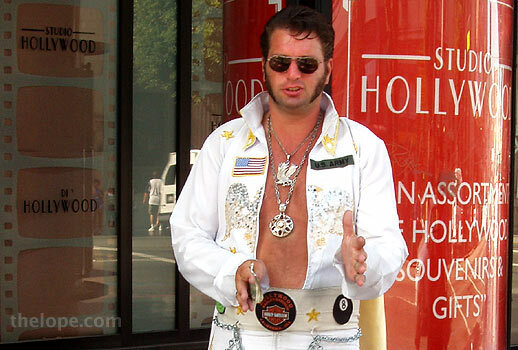 I saw only one Elvis at a time. I wonder if these guys have an Elvis duplicity agreement? Charles Laughton was my favorite Hunchback of Notre Dame: "Why was I not made of stone like thee?" Jimmy Stewart left his impression on Friday the 13th of February, 1948. Coincidentally, but hardly in the same class, Jason from Friday the 13th was nearby, although somewhat of a wallflower. I guess he was waiting for one amorously sinful young woman or couple to wander away from the pack. 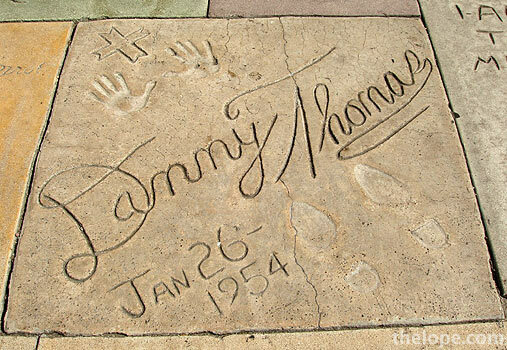 Danny Thomas left his impression on January 26, 1954. I had not previously known that among Supergirl's powers was super-whining. This daughter of Krypton was shouting "hey, we don't do this for free!" as I pointed the camera at her. I hadn't even asked her to pose; she was just there, walking around in front of tourists' cameras. Thus, I was amused when I saw this story about the arrest of an over-aggressive wookie in 2007. Later that year, a man dressed as a wookie allegedly sexually assaulted a woman dressed as Marilyn Monroe in front of tourists. The blog "Defamer" reports: "According to an officer with the LAPD, Chewbacca allegedly took the platinum-coiffed actress's hand and placed it on his private parts as the characters performed for tips from tourists." 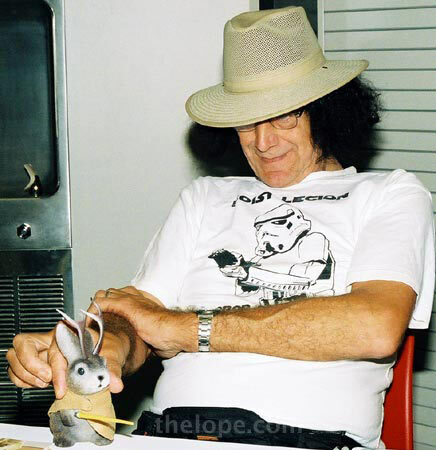 I've seen guys who dress as wookies touch unusual things, but never Marilyn's...uhh...whatever it was. Speaking of Marilyn, she had originally proposed making an impression of her derrière in the concrete, but was talked out of it. She left her hand and high-heeled shoe prints in 1953. It looks like this probably happened concurrent with the release of Gentleman Prefer Blonds. 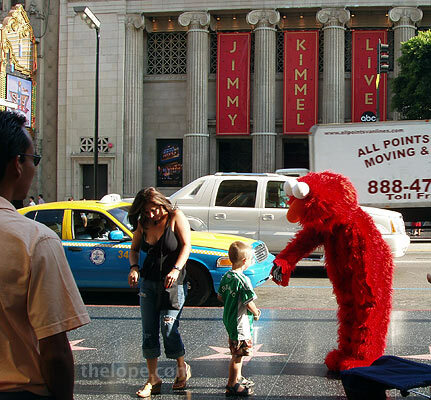 The ABC News story about the wookie also mentions someone dressed as Elmo being arrested in 2006 for allegedly bothering tourists for money. I don't know if it was this Elmo, however. I'd hate to finger the wrong Muppet. Notice the Jimmy Kimmel banners on the building across the street. That's the Hollywood Masonic Temple, built in 1922 and renovated by Disney more recently for use as a TV studio. It is currently used for Jimmy Kimmel Live (which is actually taped). 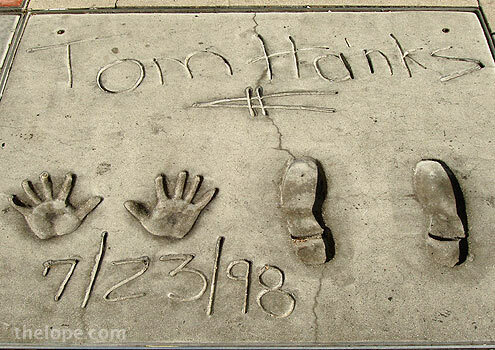 Tom Hanks left his impressions in 1998. 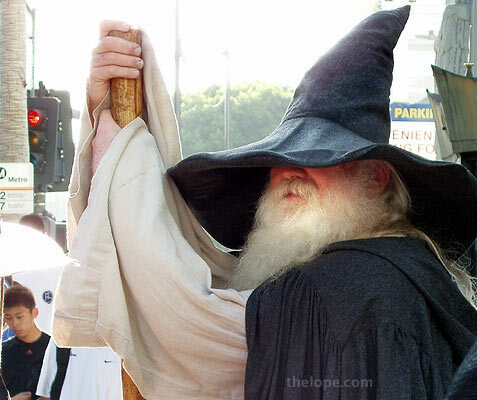 Gandolf The Gray says "You cannot pass"...without forking over some tourist bucks. Ace meets the Terminator, right over Arnold Schwarzenegger's square. 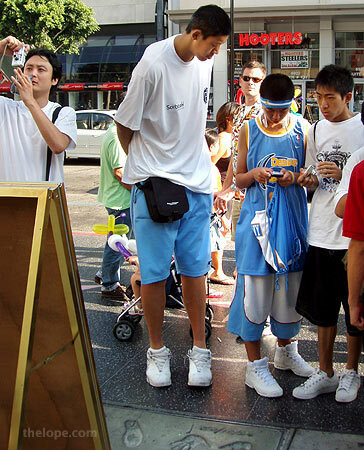 I was told by nearby sports aficionados that this is NBA basketball personality Yao Ming. He wasn't looking for money; he was just passing by. 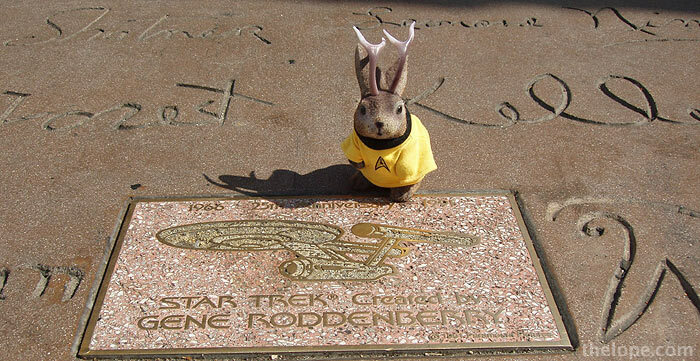 The stars of the original Star Trek series were here for the show's 25th anniversary in 1991. It has been pointed out to me that George Takei used jazz hands. Those of you who attend sci-fi conventions will note how much better their signatures look here than on that autographed still you paid so much to have. Kinda makes you want more for your money, doesn't it?